"These 'taters are delicious and perfect for a camping trip. Don't forget to dress them up with sour cream, chives, and crumbled bacon. Be sure to use small potatoes, which cook through over an open fire better than larger ones." Preheat an outdoor grill or bring a campfire to medium heat (325 degrees F to 375 degrees F). Mix together salt, Italian seasoning, pepper, and garlic powder in a bowl. Pierce potatoes in several places with tines of a fork. Rub about 1 1/2 teaspoons oil onto each potato, then rub evenly with spice mixture. Put each potato onto a 12x12-inch sheet of heavy-duty foil. 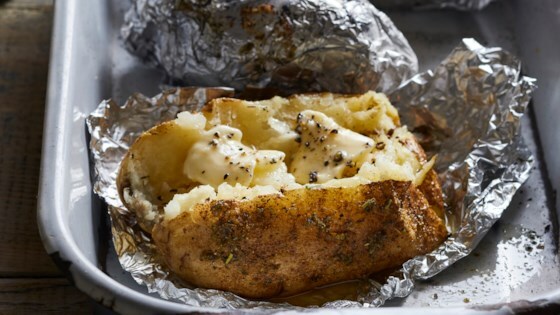 Wrap foil around potatoes and seal edges tightly, then wrap each packet with another sheet of foil. Grill packets, or nestle them into hot embers, rotating every 5 minutes, until potato flesh is soft, about 25 minutes total. (Carefully open 1 packet to check doneness with a fork. The potato's skin crisps during cooking, so you can't tell just by squeezing it.) Let rest 10 minutes before opening. Serve with your favorite toppings. To cook it indoors: Preheat oven to 400 degrees F. Prepare packets (skip the extra layer of foil) and transfer to a baking sheet. Roast until potatoes are softened, about 45 minutes. Let rest 10 minutes before opening. Yes,,,, I added Liquid smoke 2 drops to each potato after cooking. Added it to the sour cream. Love these potatoes! I have made them several times and everyone raves about them. To save time, I microwave them for 3 minutes, let them cool and then prepare. Super good and very easy. Lots of seasoning on the outside to spread on the middle of the potato when they were done. A fun way to cook potatoes over a campfire. OK, so we cooked them in our son's outdoor fire pit. I used small potatoes and they turned out great.